The good news: After spending a year and a half talking about deficits, deficits, deficits when we should have been talking about jobs, job, jobs we’re finally back to discussing the right issue. The bad news: Republicans, aided and abetted by many conservative policy intellectuals, are fixated on a view about what’s blocking job creation that fits their prejudices and serves the interests of their wealthy backers, but bears no relationship to reality. Listen to just about any speech by a Republican presidential hopeful, and you’ll hear assertions that the Obama administration is responsible for weak job growth. How so? The answer, repeated again and again, is that businesses are afraid to expand and create jobs because they fear costly regulations and higher taxes. Nor are politicians the only people saying this. Conservative economists repeat the claim in op-ed articles, and Federal Reserve officials repeat it to justify their opposition to even modest efforts to aid the economy. The first thing you need to know, then, is that there’s no evidence supporting this claim and a lot of evidence showing that it’s false. The starting point for many claims that antibusiness policies are hurting the economy is the assertion that the sluggishness of the economy’s recovery from recession is unprecedented. But, as a new paper by Lawrence Mishel of the Economic Policy Institute documents at length, this is just not true. Extended periods of “jobless recovery” after recessions have been the rule for the past two decades. Indeed, private-sector job growth since the 2007-2009 recession has been better than it was after the 2001 recession. After all, why should businesses expand when they’re not using the capacity they already have? The bursting of the housing bubble and the overhang of household debt have left consumer spending depressed and many businesses with more capacity than they need and no reason to add more. Business investment always responds strongly to the state of the economy, and given how weak our economy remains you shouldn’t be surprised if investment remains low. If anything, business spending has been stronger than one might have predicted given slow growth and high unemployment. But aren’t business people complaining about the burden of taxes and regulations? Yes, but no more than usual. Mr. Mishel points out that the National Federation of Independent Business has been surveying small businesses for almost 40 years, asking them to name their most important problem. Taxes and regulations always rank high on the list, but what stands out now is a surge in the number of businesses citing poor sales — which strongly suggests that lack of demand, not fear of government, is holding business back. So Republican assertions about what ails the economy are pure fantasy, at odds with all the evidence. Should we be surprised? At one level, of course not. Politicians who always cater to wealthy business interests say that economic recovery requires catering to wealthy business interests. Who could have imagined it? Partly, no doubt, this reflects the party’s broader slide into its own insular intellectual universe. Large segments of the G.O.P. reject climate science and even the theory of evolution, so why expect evidence to matter for the party’s economic views? 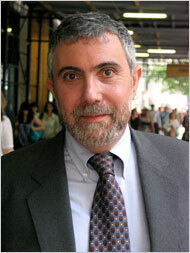 Το άρθρο του Νομπελίστα Οικονομολόγου Paul Krugman δημοσιεύεται στην εφφημερίδα «THE NEW YORK TIMES».